Click here to answer a Poll on Biosimilars for Rheumatoid Arthritis. One of the hottest topics in rheumatology today is biosimilars to for rheumatoid arthritis (RA) and other immune mediated diseases. Dozens of biosimilar medicines are in various stages of development and several are already in use in Europe and Asia. Let’s look at five key questions patients are asking. 1) Are Biosimilars for Rheumatoid Arthritis the same as generics? 2) Why are Biosimilars for Rheumatoid Arthritis not generics? Biologics are made of large protein molecules that are derived from single cell lines. That’s actually the reason these medicines are given as injections and IV infusions, in case you ever wondered. The large molecules would be broken up by the digestive system if they were swallowed. 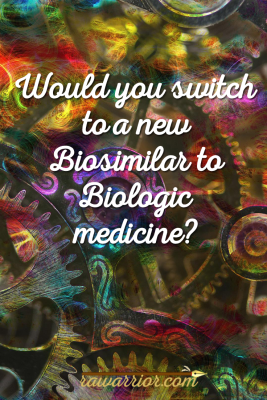 Biosimilars are created using a separate line of cells than the original biologic. They are carefully created so as to be highly similar to the originator. Biosimilars are expected to work similarly by the same mechanisms (such as TNF inhibition) as the reference products (biologics). 3) How are biosimilars tested and approved? The biosimilar approval process includes demonstrating that the biosimilar is highly similar to the originator. There should be no “clinically meaningful differences” in terms of “safety, purity, and potency.” For biosimilars for rheumatoid arthritis treatment, clinical studies are done to demonstrate similarity in pharmacokinetics (how a drug effects the body), pharmacodynamics (mechanism of action of a drug), and immunogenicity (reactivity to the product). 4) Are Biosimilars for Rheumatoid Arthritis already FDA approved? They are not in use at this time, but their launch is soon expected in the US. 5) Are Biosimilars for Rheumatoid Arthritis cheaper? As patents expire for originator biologics, biosimilars for rheumatoid arthritis have become available in several countries. Experts are estimating cost savings with biosimilars in the U.S. to be about 15% over originator biologics, but some say it could be as much as 35%. A new biologic drug can take up to a decade and a billion dollars to develop, with extensive clinical trials. The biosimilar process is much shorter so it is less expensive to develop. WHAT DO YOU THINK ABOUT BIOSIMILARS TO RHEUMATOID ARTHRITIS? 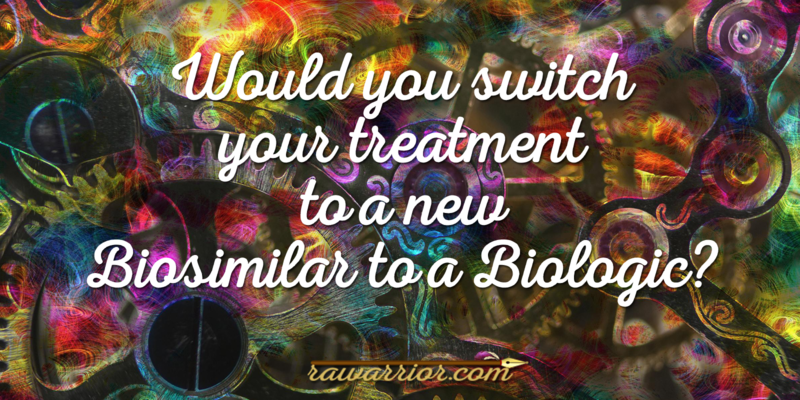 IF YOU RESPOND WELL TO YOUR CURRENT TREATMENT, WOULD YOU SWITCH TO A BIOSIMILAR? Waiting for a sale to get your Warrior sweatshirt or bumper sticker? I just got word on a HUGE ZAZZLE BLACK FRIDAY SALE! Yes, I would definitely switch, I am guessing at some point most of us will because of insurance. Now wanting to switch and being made it switch that may be two different things. Hi there I am starting on Cimzia today was wondering how long it takes to work and if you had any side effects. Thank you very much. For the most part We won’t have a choice- the insurance companies make that call. It doesn’t matter two hoots what you or I think. one after another biologic loses its effectiveness for us. Thank you for explaining “biosimilars”. It is a very helpful article. I noticed “relief” within 8 weeks of taking Cimzia. Swelling decreased in my hands and very little morning stiffness. Had to make the switch from Rituxan which was not slowing the progression. Good luck! I live in Germany and switched to Benepali, the biosimilar of Enbrel. Good news: I had less skin reaction at the injection point where Enbrel caused itching and reddness, while its biosimilar caused no skin reaction. The conservational fluid might be different (which can be an asset in itself!). Bad News: I had a pretty strong flare while on the biosimilar and now go back to Enbrel to find out if my RA is better with Enbrel (or if both have lost their efficacy). Price difference – yes, there is, but much less than what I would have expected.